Stephan Stiens was born in 1961 in Wuppertal. After completing school in Munich, he studied the concert guitar at the MOZARTEUM in Salzburg, graduating with distinction and an award for exceptional artistic performances. Promoting music (not only guitar music) is the central concern of his artistic and pedagogical work. Constant interest and curiosity in exploring a variety of ideas and projects were and are his abiding passion. His performances place the work within the composer’s entire output and historical context and, if possible, with references to contemporary music. To integrate the guitar, mostly a solo instrument, he has frequently worked with composers, dancers, actors, singers and other instrumentalists always with the aim of placing the guitar and its music as a self-evident element in a joint project. Hardly any composer appears to be closer to us than Bach. His interlacing lines leap at us wherever we hear them, they have almost become the unique characteristic of the baroque composer. But much is still unknown. Bach’s lute works, for example. Stephan Stiens withdrew with his guitar to a small basilica to record the suites including preludes and fugues. As a listener, the feeling is of having taken one’s place in a church bench. Stiens has reasons for choosing the whispering acoustic. "The guitar is an extremely sensitive instrument, dependent, more than almost any other instrument, on the acoustic. And the ending of the saraband of the E minor suite: it is impossible to achieve such a dramatic arch in any sound studio". But the project was not free of challenges. The sources are difficult, there are defective manuscripts. And: "the D minor suite presents the greatest problem, to be able to play it at all most guitarists play it in A minor, but subject to many technical errors, and therefore not acceptable. Only this, highly complex version reflects the intention of the composer, and makes the entire cycle at all possible." 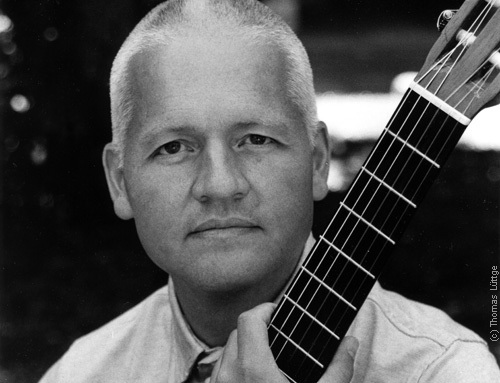 Stiens presents the suites on guitar as a wonderfully homogeneous series of conjoined works. The inclination towards dance suggests how diverting the pieces were intended to be although Bach never forgot his strict adherence to form. It needs an interpreter like Stiens to provide equal space to these contradictory forces. He never deviates from the pursuit of Bach’s spirit . With transparent illumination or intensely vibrant tone, he celebrates music which is here newly revealed to us. In 1994, Stephan Stiens recorded Bach’s violin sonatas and partitas in a version for guitar for the academica label. In Bach year 2000, Stephan Stiens presented an unusual project in Munich’s Lukas Church – contrasting Bach works with contemporary music. The Art of Fugue has been performed on harpsichord, organ, by orchestras, string quartets, recorder and saxophone quartets, purely vocally and now, for the first time, by guitar ensemble. The Guitar Company, directed by Stephan Stiens, gave the first performance of an adaptation of the work by Manfred Fleischmann. In the cycle 20th Century Guitar, Stephan Stiens together with the actor Rolf Boysen, brought Shakespeare’s texts and the musical portraits of Shakespearean figures from Hans Werner Henze’s epic guitar work Royal Winter Music to the stage. In the same year, Stephan Stiens asked the dancers Valentina Divina and Norbert Graf (soloists of the Bavarian State Ballet) to choreograph Henze’s Gloucester and Mad Lady Macbeth. In February 2001, the col legno label published the double CD Spirit of Shakespeare with the contrasting works (col legno WWE 20104), on one side the contrapuntal virtuoso lute music of John Dowland and on the other Henze’s guitar monolith Royal Winter Music. In the Haydn year 2009, the Munich guitarist Stephan Stiens & Guitar Company introduced their version of “Die sieben letzten Worte unseres Erlösers am Kreuz” by Joseph Haydn based on a version for Hammerklavier by a contemporary of Haydn’s and authorised by the composer. The idea for a guitar quartet performance of this universal work follows the Spanish commission to the motherland of the guitar. Linking the movements of the work, which was written in a time of turbulent but intact faith, Stephan Stiens has composed a series of interludes under the title “Hallraum” contrasting, as an echo of a secular age, with Haydn’s inner musical meditation. Since 1998, Stephan Stiens has collaborated with the baritone Wolf Matthias Friedrich. Together, in June 2013, they gave the first performance of the Stephan Stiens’ Lieder cycle JETZT for baritone and guitar. They gave the premiere of the song cycle Die Stimmen by the South African composer Hans Huyssen, based on Rilke poems, in Munich’s Gasteig in 1997. In 1999, performances of Franz Schubert’s Die Schöne Müllerin with accompaniment transcribed for guitar by Stephan Stiens, followed. 2001 brought the tenor Kobie van Rensburg and Stephan Stiens together. Their repertoire includes Elizabethan lute songs and folksong arrangements for guitar and tenor by Britten, Brahms, Seiber and others. The guitar, as the most popular accompaniment instrument, rarely steps outside that parameter. With his Lieder cycle JETZT for baritone and guitar, Stephan Stiens has created something completely new. In his settings of 20 poems of younger German poets under the title JETZT, the guitar is the equal partner of voice. The rich modern variety of the music reflects the voices, moods, understanding and feelings of the generation of poets born after 1970 and brings them together in a fascinating kaleidoscope. If the video is not shown, please click here (link to YouTube). The Guitar Future project began in 1988 with the request to the American composer Gloria Coates for a piece for guitar duet. Ruth Fischer and Stephan Stiens gave the work Lunar Loops its premiere at the Munich guitar festival 1989. With the guitar cycle 20th Century Guitar in February 2000 in the Münchner Musikhochschule and at aspekte in Salzburg, Stephan Stiens intensified his promotion of guitar music of the 20th century in new performing contexts (dance, recitation, light). On of the highlights of the concerts was the premiere of Vermilion Sands for guitarist and two guitars by Moritz Eggert. The Guitar Future project continued in 2003 under the tile 21st Century Guitar in the Münchner Musikhochschule with premieres for lute and guitar and with the guitar in unusual combinations (percussion, choir, dance, song). Works of Sor, Takemitsu, Schneider, Benguerel, Furrer, Castelnuovo-Tedesco and Huyssen. In 1995, Ruth Fischer and Stephan Stiens with musical friends founded the Guitar Company. Like a theatre company, it can appear in many forms, from guitar duo, trio, quartet to guitar ensemble. In the same year, the Guitar Company made its debut in Munich’s Gasteig with Electric Counterpoint by Steve Reich, the central work of all guitar ensemble music. In the same year, the ensemble received the Dieter-Ullrich Music Prize. Meanwhile, the ensemble has appeared at festivals of the Munich Gesellschaft für Neue Musik (Association for New Music) or ASPEKTE Salzburg. The Guitar Company in its present formation of 5 guitars and 2 bass guitars has a wide repertoire from Renaissance to modern. Composers from Michael Pretorius and Heinrich I. F. Biber to Steve Reich, Beat Furrer and Leo Brouwer illustrate the variety of expression of guitar music and of the ensemble. Another first for the ensemble was the première in Haydn year 2009 of “The Seven Last Words of Christ on the Cross” in the setting for fortepiano arranged for guitar. Interlude music linking Haydn’s sonatas was composed by Anton Ruppert for Stephan Stiens and the Guitar Company. With this second work of the classical repertoire, which together with the Art of Fugue seems to be justified both acoustically by the fortepiano version and Haydn’s own arrangement practices, Stephan Stiens and the Guitar Company advance the cause of ensemble music-making, which does not primarily rely on acceptance but on musical legitimation, being taken seriously. Youth Opera "The End of the Night"
Stephan Stiens created a youth opera on the themes of the quest for self and for identity. The quite banal but universal question “Who am I, where are my roots?” is the starting point of a modern fairytale. Pictures and scenes swinging between fiction and reality, a performance with dance, classical opera, ballet and theatre, to contemporary music, jazz and rock. An act with two orphans and a youth gang – street survivors. Pearl and John are searching for their father who disappeared after their birth and who is plagued by guilt and depression. FREE SOLO 2006 was a concert cycle of encyclopaedic dimensions. Throughout an entire year, he performed significant works of the repertoire, transcriptions, chamber music, new music and compositions of his own, with a scholarly introduction to each work. The guitar as an intimate, spiritual medium of the music of four centuries was the focus. Without safety belt!